This chapter describes the preparation and initiation activities required to meet the business directive for a new Enterprise Architecture, including the definition of an Organization-Specific Architecture framework and the definition of principles. This section defines the inputs to the Preliminary Phase. The TOGAF ADM is a generic method, intended to be used by a wide variety of different enterprises, and in conjunction with a wide variety of other architecture frameworks, if required. The Preliminary Phase therefore involves doing any necessary work to initiate and adapt the ADM to define an organization-specific framework. The issues involved with adapting the ADM to a specific organizational context are discussed in detail in 4.3 Adapting the ADM . The level of detail addressed in the Preliminary Phase will depend on the scope and goals of the overall architecture effort. The order of the steps in the Preliminary Phase as well as the time at which they are formally started and completed should be adapted to the situation at hand in accordance with the established Architecture Governance. The architecture framework will form the keystone to the flavor (centralized or federated, light or heavy, etc.) of Architecture Governance organization and guidelines that need to be developed. Part of the major output of this phase is a framework for Architecture Governance. We need to understand how architectural material (standards, guidelines, models, compliance reports, etc.) is brought under governance; i.e., what type of governance repository characteristics are going to be required, what relationships and status recording are necessary to ascertain which governance process (dispensation, compliance, take-on, retirement, etc.) has ownership of an architectural artifact. It is likely that the existing governance and support models of an organization will need to change to support the newly adopted architecture framework. To manage the organizational change required to adopt the new architectural framework, the current enterprise governance and support models will need to be assessed to understand their overall shape and content. Additionally, the sponsors and stakeholders for architecture will need to be consulted on potential impacts that could occur. Upon completion of this step, the architecture touch-points and likely impacts should be understood and agreed by relevant stakeholders. Architecture Principles (see Part III, 20. Architecture Principles) are based on business principles and are critical in setting the foundation for Architecture Governance. Once the organizational context is understood, define a set of Architecture Principles that is appropriate to the enterprise. Tailoring should produce an agreed terminology set for description of architectural content. Consideration should be given to the creation of an Enterprise Glossary, to be updated throughout the architecture process. There are many tools and techniques which may be used to develop Enterprise Architecture across many domains. The development of a tools strategy is recommended that reflects the understanding and level of formality required by the enterprise's stakeholders. Architecture content will be highly dependent on the scale, sophistication, and culture of both the stakeholders and the Architecture Capability within the organization. A tools strategy which recognizes the stakeholders' articulation requirements will enable more effective and rapid decision-making by stakeholders and their ownership of artifacts. The strategy should encompass management techniques, decision management, workshop techniques, business modeling, detailed infrastructure modeling, office products, languages, and repository management as well as more formal architecture tools. For example, the Balanced Scorecard technique is a best practice performance measurement tool used by business schools and many organizations that can be used successfully in architecture projects. The implementation of the tools strategy may be based on common desktop and office tools or may be based on a customized deployment of specialist management and architecture tools. Change management of the artifact deliverables is a major consideration and a degree of management control and governance of artifacts needs to be considered. Access to decisions needs to be managed carefully as many of the artifacts may contain sensitive information. Therefore the tools implementation, access, and security of the content needs to reflect the sensitivity requirements. Issues in tools standardization are discussed in Part V, 38. Tools for Architecture Development . The Enterprise Architecture provides a strategic, top-down view of an organization to enable executives, planners, architects, and engineers to coherently co-ordinate, integrate, and conduct their activities. The Enterprise Architecture framework provides the strategic context within which this team can operate. Therefore, developing the Enterprise Architecture is not a solitary activity and the Enterprise Architects need to recognize the interoperability between their frameworks and the rest of the business. Strategic, interim, and tactical business objectives and aspirations need to be met. Similarly, the Enterprise Architecture needs to reflect this requirement and allow for operation of architecture discipline at different levels within the organization. Depending on the scale of the enterprise and the level of budgetary commitment to Enterprise Architecture discipline, a number of approaches may be adopted to sub-divide or partition architecture teams, processes, and deliverables. Approaches for architecture partitioning are discussed in Part V, 36. Architecture Partitioning . The Preliminary Phase should be used to determine the desired approach to partitioning and to establish the groundwork for the selected approach to be put into practice. The Preliminary Phase may be revisited, from the Architecture Vision phase (see Part III, 18. Applying Iteration to the ADM), in order to ensure that the organization's Architecture Capability is suitable to address a specific architecture problem. One of the main challenges of Enterprise Architecture is that of enterprise scope. The scope of the enterprise, and whether it is federated, will determine those stakeholders who will derive most benefit from the Enterprise Architecture Capability. It is imperative that a sponsor is appointed at this stage to ensure that the resultant activity has resources to proceed and the clear support of the business management. The enterprise may encompass many organizations and the duties of the sponsor are to ensure that all stakeholders are included in defining, establishing, and using the Architecture Capability. Significant elements of these need to be articulated so that the sponsor can identify all the key decision-makers and stakeholders involved in defining and establishing an Architecture Capability. The Preliminary Phase defines the Architecture Principles that will form part of the constraints on any architecture work undertaken in the enterprise. The issues involved in this are explained in Part III, 20. Architecture Principles . The definition of Architecture Principles is fundamental to the development of an Enterprise Architecture. Architecture work is informed by business principles as well as Architecture Principles. The Architecture Principles themselves are also normally based in part on business principles. Defining business principles normally lies outside the scope of the architecture function. However, depending on how such principles are defined and promulgated within the enterprise, it may be possible for the set of Architecture Principles to also restate, or cross-refer to a set of business principles, business goals, and strategic business drivers defined elsewhere within the enterprise. Within an architecture project, the architect will normally need to ensure that the definitions of these business principles, goals, and strategic drivers are current, and to clarify any areas of ambiguity. The issue of Architecture Governance is closely linked to that of Architecture Principles. The body responsible for governance will also normally be responsible for approving the Architecture Principles, and for resolving architecture issues. The issues involved in governance are explained in Part VI, 44. Architecture Governance . 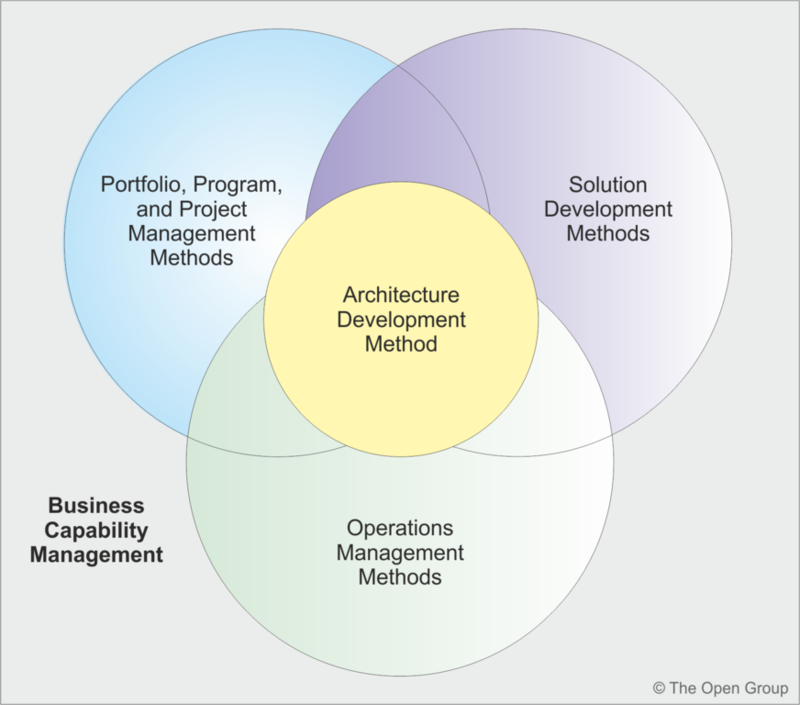 The TOGAF Architecture Development Method (ADM) is a generic method, intended to be used by enterprises in a wide variety of industry types and geographies. It is also designed for use with a wide variety of other Enterprise Architecture frameworks, if required (although it can be used perfectly well in its own right, without adaptation). The TOGAF framework has to co-exist with and enhance the operational capabilities of other management frameworks that are present within any organization either formally or informally. In addition to these frameworks, most organizations have a method for the development of solutions, most of which have an IT component. The significance of systems is that they bring together the various domains (also known as People, Processes, and Material/Technology) to deliver a business capability. 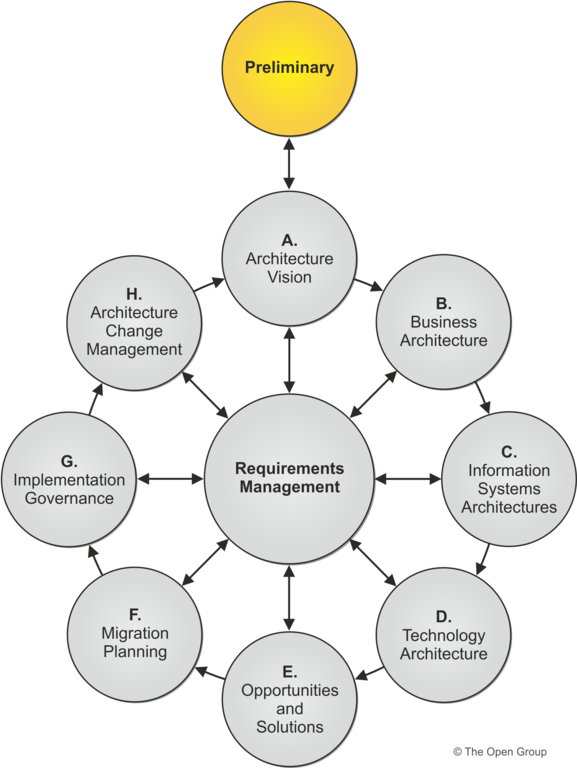 As illustrated in Figure 5-2 , these frameworks are not discrete and there are significant overlaps between them and the Business Capability Management. The latter includes the delivery of performance measured business value. The overall significance is that the Enterprise Architect applying the TOGAF framework cannot narrowly focus on the IT implementation, but must be aware of the impact that the architecture has on the entire enterprise. The Preliminary Phase therefore involves doing any necessary work to adapt the ADM to define an organization-specific framework, using either the TOGAF deliverables or the deliverables of another framework. The issues involved in this are discussed in 4.3 Adapting the ADM . Figure 5-3 illustrates a more detailed set of dependencies between the various frameworks and business planning activity that incorporates the enterprise's strategic plan and direction. The Enterprise Architecture can be used to provide a structure for all of the corporate initiatives, the Portfolio Management Framework can be used to deliver the components of the architecture, and the Operations Management Framework supports incorporation of these new components within the corporate infrastructure. The business planners are present throughout the process and are in a position to support and enforce the architecture by retaining approval for resources at the various stages of planning and development. The solution development methodology is used within the Portfolio Management Framework to plan, create, and deliver the architectural components specified in the project and portfolio charters. These deliverables include, but are not exclusively, IT; for example, a new building, a new set of skills, production equipment, hiring, marketing, and so on. Enterprise Architecture potentially provides the context for all enterprise activities. The management frameworks are required to complement each other and work in close harmony for the good of the enterprise. Business planning at the strategy level provides the initial direction to Enterprise Architecture. Updates at the annual planning level provide a finer level of ongoing guidance. Capability-based planning is one of many popular techniques for business planning. Enterprise Architecture structures the business planning into an integrated framework that regards the enterprise as a system or system of systems. This integrated approach will validate the business plan and can provide valuable feedback to the corporate planners. In some organizations, the Enterprise Architects have been moved to or work very closely with the strategic direction groups. The TOGAF approach delivers a framework for Enterprise Architecture. Project/portfolio management is the delivery framework that receives the structured, detailed direction that enables them to plan and build what is required, knowing that each assigned deliverable will be in context (i.e., the piece of the puzzle that they deliver will fit into the corporate puzzle that is the Enterprise Architecture). Often this framework is based upon the Project Management Institute or UK Office of Government Commerce (PRINCE2) project management methodologies. Project architectures and detailed out-of-context design are often based upon systems design methodologies. Operations management receives the deliverables and then integrates and sustains them within the corporate infrastructure. Often the IT service management services are based upon ISO/IEC 20000:2011 or BS15000 (ITIL). Capability Maturity Models (detailed in Part VI, 45. Architecture Maturity Models) are useful ways of assessing the ability of an enterprise to exercise different capabilities. Capability Maturity Models typically identify selected factors that are required to exercise a capability. An organization's ability to execute specific factors provides a measure of maturity and can be used to recommend a series of sequential steps to improve a capability. It is an assessment that gives executives an insight into pragmatically improving a capability. A good Enterprise Architecture maturity model covers the characteristics necessary to develop and consume Enterprise Architecture. Organizations can determine their own factors and derive the appropriate maturity models, but it is recommended to take an existing model and customize it as required. Several good models exist, including NASCIO, and the US Department of Commerce Architecture Capability Maturity Model. The use of Capability Maturity Models is detailed in Part VI, 45. Architecture Maturity Models . Other examples include the US Federal Enterprise Architecture Maturity Model. Even though the models are originally from government, they are equally applicable to industry.